We make our way into the desert, seemingly barren. Yet still somehow mesmerizing. Our drive to the desert gives us ample time to reflect and pinch ourselves to remind us that we, in fact, are not dreaming, “Is this real life?” The desert Is like that. Much like staring into a burning flame. We watch the rolling hills undulate as we pass by on a pothole filled road. The only traffic we hit are a few men on ‘donkey-back.’ The earth is blanketed in a soft, dry, light golden beige as far as the eye can see. When all of the sudden, over a hill, hidden and tucked away, a cluster of white tents emerge set against the backdrop of the warm desert sky. We are speechless, yet again. For a second we are eight years old again. Young girls. Seeing the world for the first time. And then, we all turn to each other once again, and in unison exclaim “Is this real life?!”. We continue to giggle, because what else do fully grown women do when they're simply blown away at the surrealism of it all; basking in a state of delirious wonder. Staring off into the vast nothingness. A gift that allows us to see clearly the thoughts that travel across our minds. We shed another layer, revealing a new stratum within our being, that had been hidden away with time. Allowing us to gain access to a deeper, richer, more vulnerable part of our soul that we might have tucked away In a box at some point earlier in life for safe keeping, left to be rediscovered only when we are ready. For some, these layers melt away with the desert heat, they have held onto this layer and have waited for some time to release it to the wind. For others, this is a layer that they hold dear. And know I will be a part of them forever. They honor it and cherish it. Some see this layer for the first time. There are tears, because they are reacquainting themselves with a part of themselves that they have never seen, or have lost. This is the magic of healing. Here, we are reminded of not only the value of connecting to one another, but to the communities in which we travel, and gain a better understanding of a culture that is unfamiliar to us. One of the foundational principles of WE ARE’s mission is the desire to give back to the destinations visited; redefining how we answer call to travel. Each retreat focuses on a different social and environmental cause. 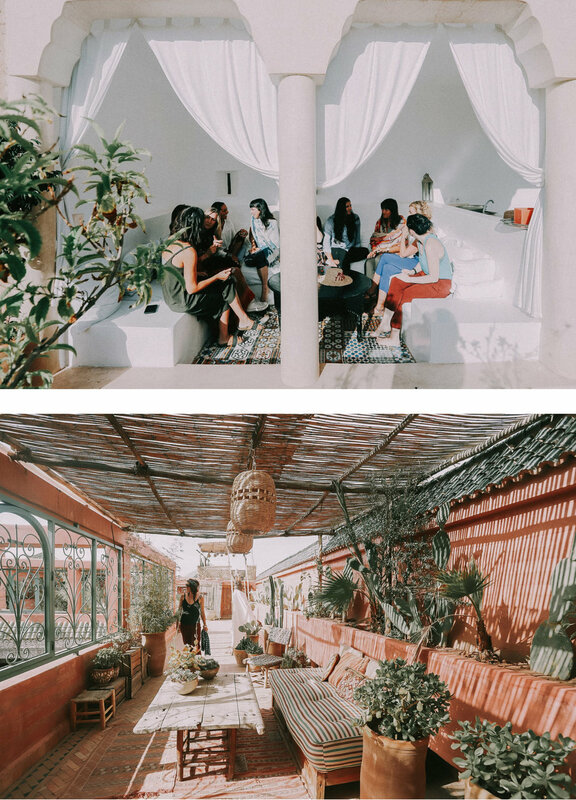 No matter the adventure, for every attendee, WE ARE plants a tree through the international movement "Treedom" in order to help rebuild forests, capture CO2 emissions, improve air quality and create a tangible symbol of what the women of WE ARE stand for. On this trip, we donated articles of clothing from our very own suitcases to Project91, a charity that creates opportunities for employment and and education. Project91 collects garments that women donate to sell in their local shop in which 100% of the sale price goes directly to the charity. With the money, women are able to support their families and even send their children to school as this project focuses on the support of young people and providing education. The clothes that were not donated were up-cycled into rag-rugs, in which we weaved our old garments into rugs. In Imsouane, we held a beach clean up, a small and simple effort, that shines a light on the issues of waste, particularly when it pours directly into our oceans. It was beautiful to see and be apart of the true community engagement because as we were cleaning with local surfers (still in their wetsuits) who helped and joined us with this initiative. We cannot simply filter the entire ocean, but we can filter what we are putting and pulling out of it. 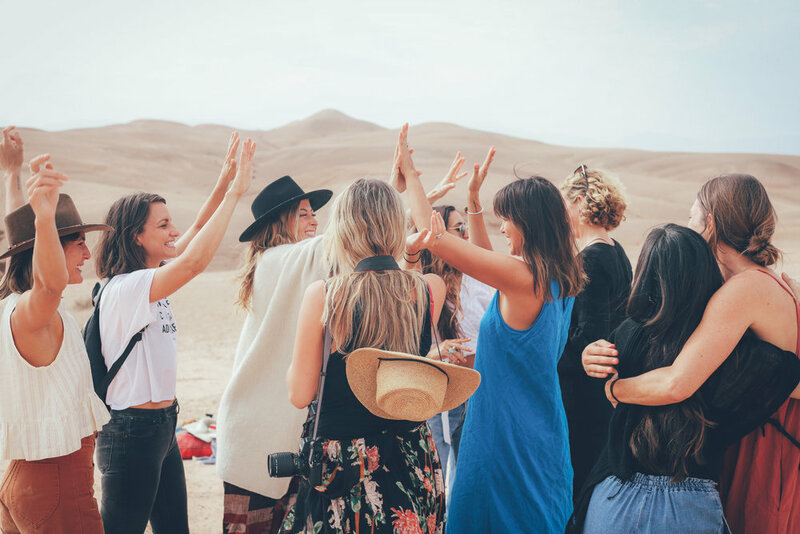 There is a shift in consciousness all around us, and the types of women who are called to be creative adventurers are also called to be at the forefront of that shift; leading the way, connecting to themselves so they have a better capacity to give to others. Life's great gift.